"Tomb of the Blind Eternities"
, , Sacrifice Tomb of the Blind Eternities: You may cast planeswalker cards from your graveyard this turn. If a planeswalker card would be put into your graveyard from anywhere this turn, exile it instead. Daij_Djan Simple and a "very black" ability. I'd make it to lose 2 life. Flo00 It's a good interaction, but not very creative (just my opinion), as there are a few lands with similar effects (add X color mana just for X creature, etc). kefke Maybe add " : Add " I like the card, but i feel that is just going to be used 1 or 2 times before a planeswalker is dead. And it seems to be a bit confusing at first read. melono The planeswalker token could have maybe a +1 mana ability? I really don't know how powerful would your card be. Overall, i like the idea, but the abilities feels a bit generic. monger Maybe a bit powerful in white, as you can cast Teferi. Nice ability though. Jartis Good card. I'd make it to add loyalty counter to the land, and an ability to remove it and activate abilities from planeswalkers, as for now, add one loyalty is something i dont think is contempled in the rules as you say. Well, i will select kefke . It is a bit of a mess of a card to read, but it's the most creative one i think. I'd like to see a rework to balance it or make it "simplier" but powerful. Wow, really? Well, I suppose that "a bit of a mess" describe my designs pretty well. I'm still stuck back in Ice Age most of the time. Haha. Funny, the challenge would have been very similar had I won. Great minds, I guess. XD Also, as a sidenote, Wastes isn't a basic land type, unfortunately. Something about them not wanting to mess with dominion? I don't see why it couldn't be for the purposes of the challenge, but it isn't as of right now. Anyway, on to the entry. Bountiful Isle enters the battlefield tapped. Constellation — Whenever Bountiful Isle or another enchantment enters the battlefield under your control, add . Also, as a sidenote, Wastes isn't a basic land type, unfortunately. I know. That's why I said "basic land subtype" instead of "basic land type". Trying to be careful in my wording. 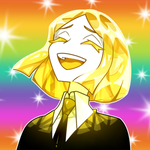 Also, I think the thread rules specify a need for a render? Wastes are not a subtype, either. They're just basic lands named Wastes. As you can see from the image below, they have no subtype. 1. Unless you're actually planning to make a card that is a Wastes, this is all pointlessly pedantic. 2. If you are planning to make a card that is a Wastes, then Wastes would be its subtype, and this discussion is still pointlessly pedantic. Actually, no, Wastes wouldn't be its subtype, and this kind of is relevant. can't be tutored with stuff like Ranger's Path or fetchlands such as Misty Rainforest (which are played a lot in competitive formats) despite producing , because it doesn't have the Forest subtype and adds nothing to your domain number for cards like Tribal Flames. can be tutored with Ranger's Path and Misty Rainforest because it does have the Forest subtype and does add one to your domain number for cards like Tribal Flames (unless you already control another Forest, of course). Therefore, cards that don't have a subtype can be pushed a bit more. This is the important part when it comes to designing lands. There is no such thing as a Forest card type. Forest is a land card subtype, not a card type. Land is a card type. Wastes have the land type, but have no land card subtype, and thus can't be fetched with fetchlands, can't be tutored with Ranger's Path variants, and don't add to your domain. If I understand what you're going for, you want us to design a card that adds either or only one colour of mana. Is that correct? Ineffable Wasteland enters the battlefield tapped. When Ineffable Wasteland enters the battlefield, sacrifice a land or an enchantment. If you sacrifice a nonland enchantment this way, add and scry 2. This is my current entry. No, that is not correct. I'm looking for a card that has the name of a basic land as its subtype, regardless of whether the land is one of the five basic land types, or a Wastes. As in, the same way that cards that are not the original card Desert from Arabian Nights can still be "a desert" because the card's subtype is Desert. For the basic land types, this has additional rules associated with it. For the card Wastes, it does not. Both of which should probably be taken into account when deciding what the card will do. Sorry if this condition was hard to understand. EDIT: Please note that the Desert example isn't picked arbitrarily. Arabian Nights also introduced desertwalk and cards that could not take damage from deserts. Because the more modern deserts have specifically the "Desert" subtype, the abilities of these old cards interact differently with them than if that type were "dunes" or something. The fact that the subtype used is the name of an existing card that other cards already interact with is relevant from a mechanical standpoint. So, in the case of this challenge, a card having the subtype "Wastes" would not be able to be searched by cards that pull basic lands, but could be searched by cards that pull Wastes specifically, and would interact with other effects that specify Wastes in their text. Last Edit: Dec 5, 2018 21:42:05 GMT by kefke: Additional clarification. Oh, ok. No problem. I'll think about how to change my entry, then. This requirement hasn't been strictly enforced, but you can do so as the challenge creator if you want. It was just a way of making the judging more interesting, really. All right, looks like it's about time to judge these. Jartis First of all, I'm glad that you took off the Landfall, as that made the card a beast. 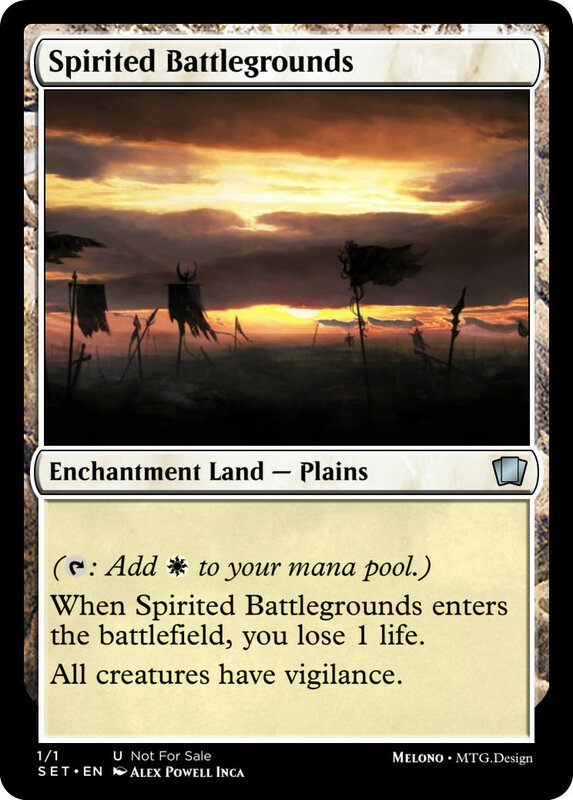 Even as it is, it might be a pretty powerful land, but it has much less potential to spiral out of control. Still, Constellation is a solid choice of mechanic. If anything, this design might be a little too obvious? Neottolemo It looks like you never got around to changing your entry, so this doesn't technically meet the requirements of the challenge. That said, it's an interesting direction to take things. ETB tapped and a sacrifice requirement balance out the double-mana generation well, I think, and the opportunity to get mana the first turn it's out, as well as scry, offers an interesting choice and underscores the enchantment aspect. For the next three entries, let me just get out of the way first that I appreciate tying in your submissions to the Theros gods, so as not to repeat myself. That's an easy way to emphasize the enchantment aspect from a thematic standpoint, and I don't consider it a cheap tactic at all. Also, I think everyone who provided a render had a good eye for art, and picked images that are both striking and appropriate. kinotherapy First of all, thank you for being the first person to give a render and first to use the half-enchantment frame. The ability almost feels like it should be Constellation, especially with the flavour text, though it makes sense that it isn't. It has an appropriately "Thassa-like" ability, though I think it plays a little safe. gateways7 Like with the previous card, the ability seems very in keeping with the god you're trying to evoke, but also very safe. 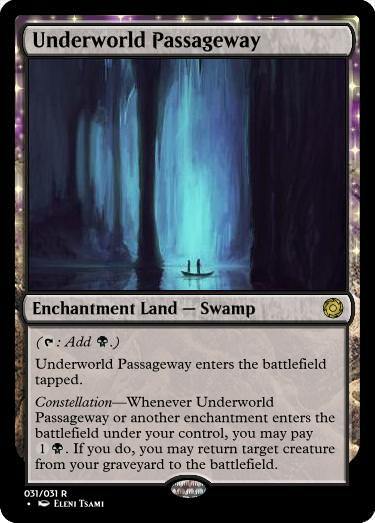 Especially as a tap ability, it actually feels like something that could be on a land without it being an enchantment, so I think that more could have been done to play up that aspect. Flo00 I got the reference right as I was reviewing the card. 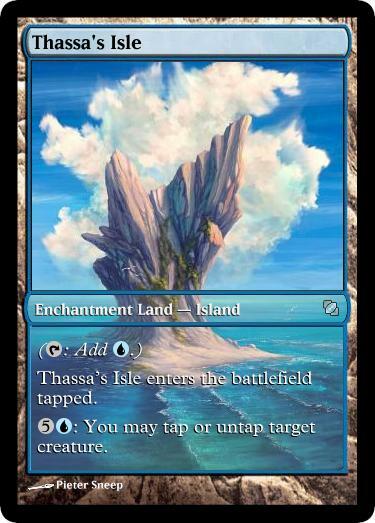 Essentially, your card is a land with a built-in Thassa's Ire. The pun makes me smile, but this choice actually made me question the higher cost for the ability than the card it's based on. I'm assuming it was to compensate for the card also being a mana source itself, but going from 3U to 5U probably wasn't necessary since it also makes a more desirable removal target. melono There's a lot going on, here. The first thing I notice is that this is a card with two downsides. First, it hurts you when it comes into play. Second, it lets your opponent(s) get the benefits too. On the other hand, in a team game, it also helps your team, so there's that. 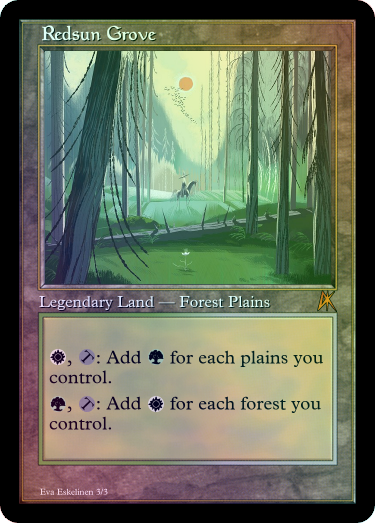 My first thought was that this might actually err on the side of making you pay too much for what could easily be a CMC1 effect on its own (creatures you control have vigilance), but then I considered that the original run of artifact lands were Never-Reprint-This strong with just being artifacts and coming in untapped. So this is probably a reasonable amount of downside. gamma3 Some really good theming on this one. My main concern is that the ability might be a little too strong. For the cost listed, a return to hand might be better, given that it's a repeatable effect. Daij_Djan This was the only legendary land, even with the three god-inspired ones, and it's an interesting one for sure. It's a nicely vicious, very Black ability, and some decks could probably even be built around it. Like with the "Spirited Battlegrounds" submission, this comes with a couple of built-in downsides. 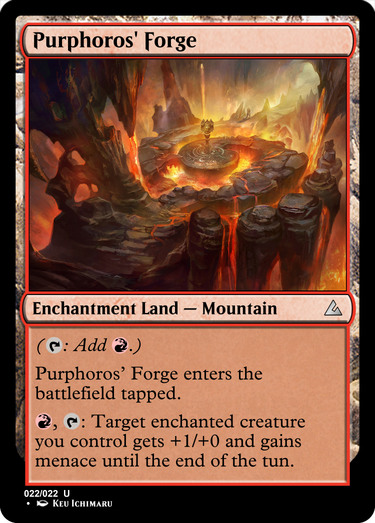 It's a well-named card that sounds like something you could see in a set, and generates some interest for just what kind of horrors take place in/issue forth from this temple. Since we're at the end, I'm going to tip my hand a bit and say that I almost picked this as my winner. Final thoughts - I enjoyed seeing what everyone came up with. The only thing that really disappoints me is that everyone played it pretty safe. I would have liked to see people get a little more "out there". Maybe some stronger effects with stronger drawbacks. 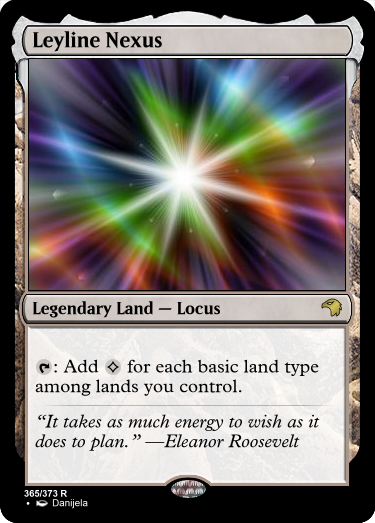 Maybe something like a dual land with a modified version of Land Tax built in...eh, I'll keep that idea for future use. In any case, my final pick is "Spirited Battlegrounds". 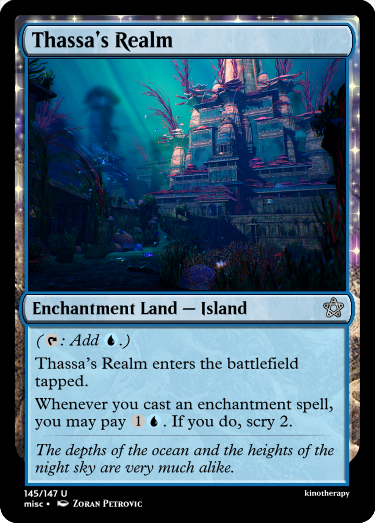 I feel like this card has a really creative approach to designing something both land and enchantment, and showed a good understanding of the inherent challenges in balancing such a thing. Ultimately, what put it above the second pick though is that I feel like its effects would be more fun to play a game with. So, congratulations to melono on winning. Thanks for the win kefke ! Design a (balanced) land card that taps for some kind of mana "for each [...]", like how Tolarian Academy taps "for each [artifact you control]". 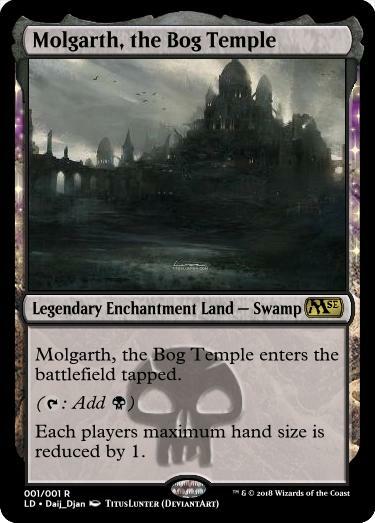 : Add for each basic land you control. Add R to your mana pool for each nontoken goblin you control. , , Tap an untapped creature you control: Choose one of the tapped creature's colors. Add one mana of that color for each creature you control with that color. 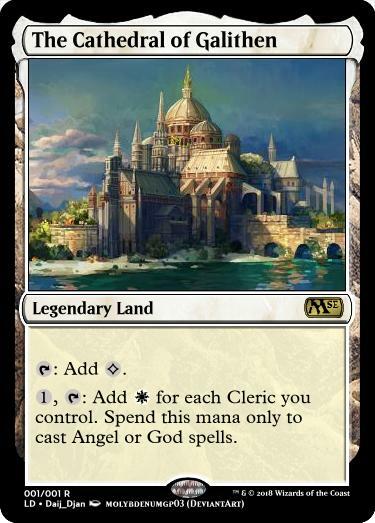 Serra's Sanctum which is also from Urza's Saga. Possibly there are more, but those are the ones I found. Storm Tower enters the battlefield tapped. : Add one mana of any color for each spell cast this turn. Here's a variant on Mishra's Factory. 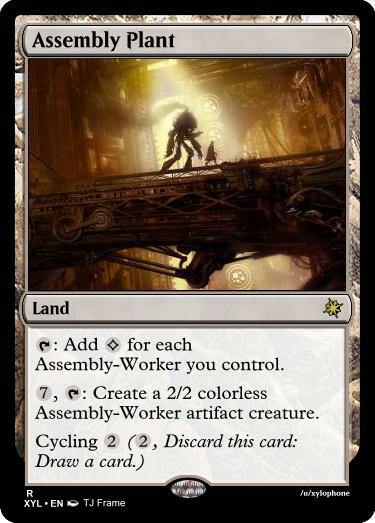 I'm not sure whether something like this can be balanced so I gave it cycling for when you won't be able to generate mana or assembly-workers. ::2::, ::tap::: Add ::R:: to your mana pool for each instant and sorcery card in your graveyard. it's simply fact, spells carved in stone withstand time more so than ink and paper.